One of the most common yet painful foot disorders right now is Plantar Fasciitis. It is often that people who have this condition do not even realize that they have it probably because the condition goes away over time. If in case you are not familiar with this condition, it is the inflammation of the Plantar Fascia which is responsible for giving support for the whole foot. For some, finding the best arch support shoes can help but what will you do with best shoes for arch support without the proper insoles. There is another type of treatment that you would like to do first and that is to use insoles so that your feet will become more comfortable no matter what type of shoes you are wearing. If you suffer from plantar fasciitis you are not alone. Up to 15% of the population will suffer from this painful condition sometime during their life. Tread Lab’s Plantar Fasciitis Insoles are designed to protect your plantar fascia from further damage by supporting the arch of the foot. The insoles, made from 4mm polyurethane foam, offer firm support, helping to disperse the body weight over the full length of the foot, and preventing excess rolling of the foot during running or walking. The insoles are available in four different arch heights allowing you to select the best fit for your foot. The deep structured heel cup ensures perfect foot alignment. There are four different sizes available to match any foot and any shoe. If you still have doubts about this purchase, Tread Lab offers a 30 day fit guarantee, allowing you to order more than one pair of insoles to test the arch height, and then return the pair that does not suit your foot. Tread Labs’ Insoles are more expensive than most insole products offered by the competition, but Tread Labs offer unconditionally guaranteed arch supports, four arch heights, firm foot support, and tops that can be replaced, extending the life of the insoles. Tread Labs Insoles, enable sufferers of plantar fasciitis to carry out the everyday tasks by supporting the arch of the foot, alleviating chronic foot pain. Check the Latest Price on Tread Labs! 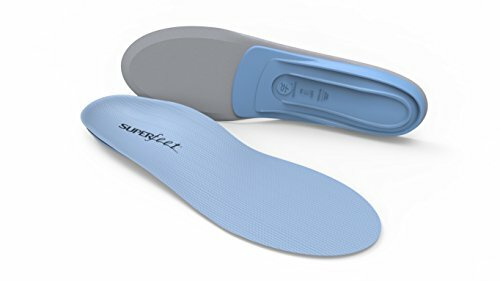 The fact that these insoles can be used in order to help give support for your feet and provide the shape that your feet needs in order to stay supported makes the Superfeet Blue Premium Insoles the best choice for you. There are three things that you can get from it: First, you will have a structured heel cup which will allow your feet to not feel the shock due to running or simply walking on hard floor. Second, your rear foot will also get more support. The front of your heel will also get a lot of support too. Third, you can be sure that your foot will get enough stabilization to give your feet enough support no matter what you are doing. 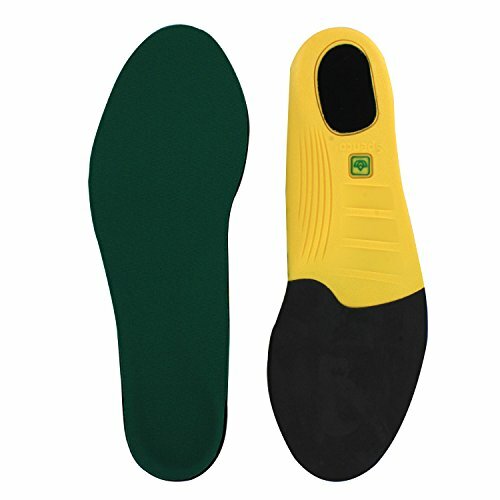 What you have to remember when purchasing this insole is that purchasing the right shoe size will help tremendously. The right arch of the insole that you will purchase will also play a huge role on how successful the insole is going to be on your foot. This may be steep as compared to your regular insole but for it can make the pain that you are feeling go away. If you are constantly moving and you are always busy, you can now choose the best insoles for you – Sorbothane Ultra Graphite Arch Insole. What sets it apart from all the other insoles is that it can absorb about 94.7% of the shock that you might experience in every step that you take. Aside from being able to reduce the pain that you might feel, it will also make your feet more energized so you can walk or run further than what you have intended. The excellent shock absorption of this insole makes it the perfect insole to use if you are afflicted with plantar fasciitis. The insole itself is thin enough so that it can be worn with different pairs of shoes even if the shoes only have limited space. If you are looking for gel insoles and shoe inserts that can help alleviate the pain that you are feeling because of Plantar Fasciitis, the Syono Orthotics Gel Insoles and Shoe Inserts for Men and Women may be the right product for you. With this product, you can be sure that simple activities you are unable to enjoy because of your condition can be fully enjoyed again. You can do things like running, walking, cycling and even doing other physical activities because the insoles will ensure that your pain will be lessened tremendously. Whether you just want to lessen the strain on your feet brought about by the different activities that you do or you want to do more throughout the day, remember that these insoles can help. The size will not be tricky because you can cut them to your desired size. They are normally oversized. It is likely that you are having some trouble using your running shoes because the pair that you have bought just does not offer the support that you need to enable you to run for long distances. 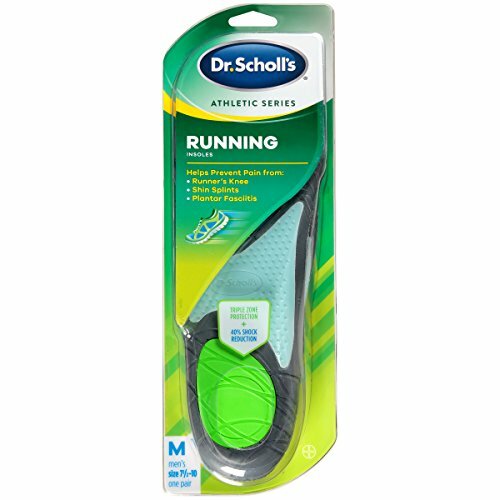 With the use of Dr. Scholl’s Active Series Replacement Insole Men’s, you can be sure that running will be easier to do. It will take time before the pain will completely go away but once it does, you can be sure that doing hard physical activities which also includes running can be easier to accomplish. This is the best insoles for you if you have absolutely no arch and you would need a little to help support your feet better. The arch support is considered to be great and it is firm enough to hold the whole foot. 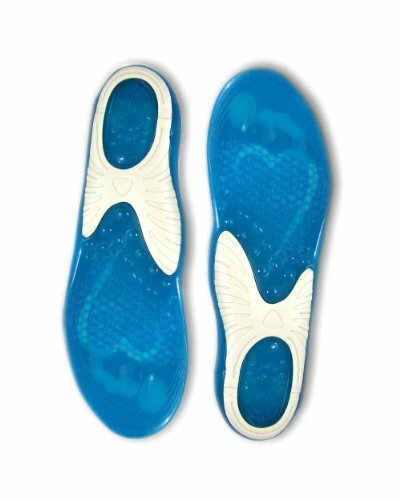 Feel the instant and amazing transformation of your feet with these insoles. Are you searching for insoles that will maximize the shock absorption that it will take every time you run, bounce or jump? The Spenco Polysorb Cross Trainer Insoles may be the right product for you. Whether you are an athlete who would like to have better support for all of the physical activities that you have to do or you are suffering from plantar fasciitis and you would like to be pain – free, this product will give you what you need. It will be easy to adjust to these insoles simply because they are not that as thick as the other insoles that you may have tried in the past. What you have to remember though is that like other insoles, these insoles will also wear out over time especially if you use them often in different pairs of shoes. You are recommended to get more than one pair so that the shoes you usually wear can have separate insoles. Provide the proper support for your feet for a low price. The Footlogics Orthotic Functional Insoles will be particularly helpful for people for those who would need a deep heel cup in order to provide the support that the foot needs. The EVA makes sure that from the midsole, the feet will be supported well. Foot fatigue can be lessened significantly so it will be easier to do running, jogging and walking because most of the shock brought about by movements will be lessened. The great thing about this is that the insoles are over sized which mean that you can cut it depending on your own specifications. Footlogics understand that even though there are standard sizes, each foot has its own dimensions. The right fitting insole will provide better support and comfort for the feet. You will not regret it at all. 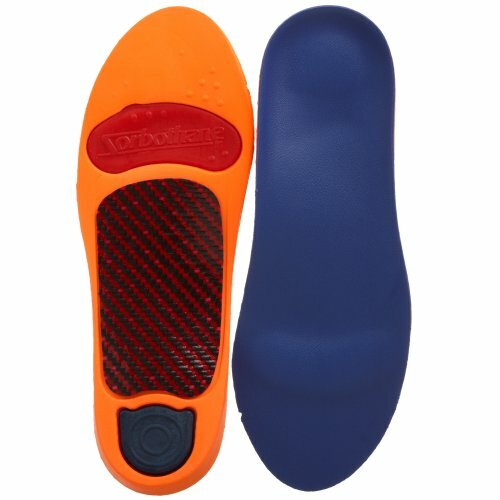 It is possible that you would like to get all of the benefits that insoles can offer but you are not sure if the insoles that you will get will work, with Powerstep Pinnacle Adult’s Insole Blue, you can be sure that if cushion and support are two of the things that you will need, you can get that. You can already imagine yourself being able to exercise again without having to complain about the pain that you are feeling on your heel afterwards. Even if you have a high arch and that is causing your Plantat Fasciitis condition, you can be sure that the insoles will adjust depending on what your feet needs. There is no need to check out the products that are being offered by your local drugstore anymore. The Powerstep Pinnacle Adult’s Insole Blue may be just the insole that you need. Do remember that it might take a few days before you get used to them but once you are okay with their fit, you can start noticing the difference that it can give. Are you searching for insoles that you can use whenever you would like to run? It is likely that this is just the right product that you are searching for. Walking again even for just a short distance is something that people with plantar fasciitis cannot do anymore but with this insole, it is possible. This product is so good that your podiatrist will probably recommend this product out of all the products that are available. Make all of the pains, aches and problems of your feet go away with the use of this product. If you are worried that it will not last for a long time you have to know that even with regular use it can last for more than a year. It also costs less than other inserts that do not work that well. Be very careful about the sizing because the size that you will purchase will have an effect on how well these insoles will work. Obesity – Studies show that more than half of the people who are afflicted with Plantar Fasciitis are normally obese or at least overweight. When people are overweight, they usually strain their plantar fascia more and this strains the plantar fascia and makes it more inflamed. Flat Feet – Having absolutely no arch can bring some trouble to the feet because the plantar fascia is constantly in contact with the hard floor. High Arches – It does not mean that just because you have high arches, this gives you lesser chances of acquiring this condition. This can also be bad for your feet especially your plantar fascia because it has to balance more as compared to feet with normal arches. Excessive Running – Have you ever heard of the saying “Too much of anything is bad for you?” If you have, then you should know that excessive running can also be bad. Constant pressure on the plantar fascia can strain the plantar fascia and result to plantar fasciitis. Lack of Exercise – If excessive running can be bad for the feet, the lack of exercise can also be bad because this does not provide enough flexibility to make the feet more used to the movements that will be made. Aside from these reasons that are mentioned above, there are still other reasons that might cause people to feel heel pain such as wearing high heels for a long time for the ladies or wearing shoes that do not fit right. It is possible that you will not be aware that you have it because the pain comes and goes. Usually, there are some symptoms that you have to look for such as the fact that the pain that you are feeling on the heel of your feet tends to worsen over time especially if you have been standing the whole time. Also, you might experience excessive pain on your feet in the morning or after a long rest. There are even instances when the plantar fascia becomes ruptured. As a result, you may have some symptoms like swelling of the heel area of the feet and a clicking sound every time you try to move your feet. In order to be sure if you have plantar fasciitis, it will be a good idea to be checked by your doctor. The doctor will perform a series of tests before the diagnosis can be given. Once it is clear that you have plantar fasciitis, there are several things that you can consider. First, you may want to consider undergoing several treatments that do not require surgery. These treatments may be able to let you have no pain for a certain period of time. The amount of time that will allow you to not feel any pain will also depend on the type of treatment that you will take. There are times when people do not notice any effect with the non surgical treatments that they have undergone. Another option that you can take is to have surgery although this is more recommended to people who have severe plantar fasciitis or like mentioned earlier, people whose plantar fascia has already ruptured. For some, finding the best arch support shoes can help but what will you do with best shoes for arch support without the proper insoles. There is another type of treatment that you would like to do first and that is to use insoles so that your feet will become more comfortable no matter what type of shoes you are wearing. Even if you think that it is easy to find the right insoles, you have to consider that there are a lot of brands, types and kinds that you have to choose from. With the wide array of insoles that you can choose from, which one are you going to pick. There you have it. The above mentioned things are just some of the best insoles for plantar fasciitis that you can consider. Why do you need to spend a lot of money on some non surgical treatments that will only work for a limited period of time when you can easily purchase the right insoles and change your life forever? You also do not need to spend a lot of money purchasing the products that your podiatrist is going to recommend because you can purchase from a reputable shop that will offer the products for less than the expected price. Remember that it is important to check the reviews of each product that you are considering to purchase for heal spur. If you see products with reviews that are not too good, you may want to look elsewhere. A lot of people would like to be honest so that they can also help other people with their purchases. If you are unhappy with the insoles that you have received, there are also some brands that will allow you to return the product that you have received. Some would have to try out different insoles until they find the right one for them. Do not give up immediately. You have to remember that there are several ortaheel insoles available for you.